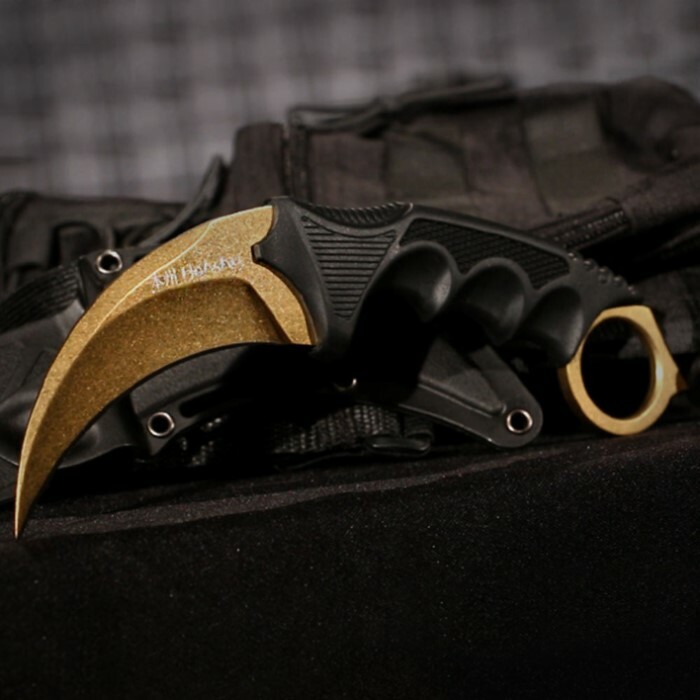 You’ve been looking for that custom, one of a kind skinned karambit that nobody else has? Well, you found it here at True Swords. 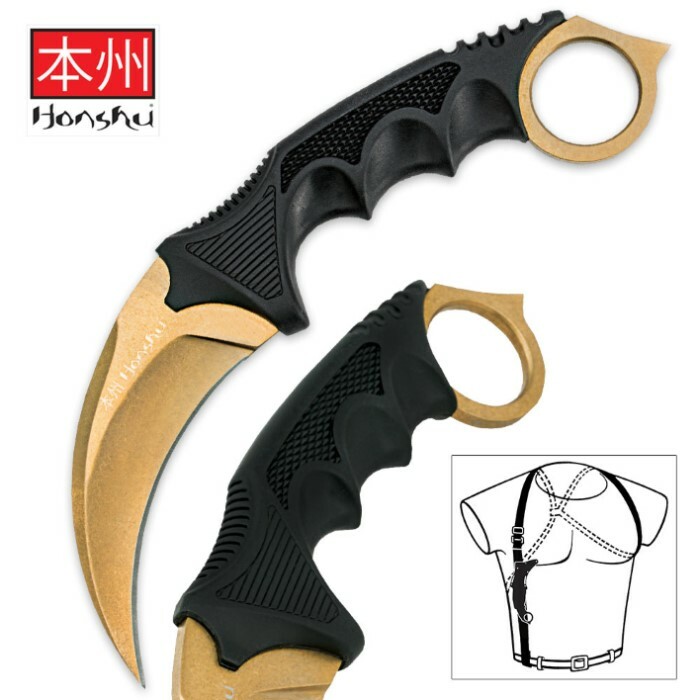 This is titanium gold plated Honshu karambit, just like those seen in your CS:GO games. We were able to obtain a very limited quantity of these knives and don’t know how long we will have them in stock, get yours now before it’s too late. It even includes a shoulder harness with locking sheath, don’t miss out! First impression, the knife seemed to be much bigger than I expected. The harness was alright, not super convenient in how it's placed. The biggest let down was the sharpness of the blade. It wasn't very sharp at all, which was very disappointing. I guess I can't really complain with the price though. RIght out of the box this knife was superbly sharpened, sliced through a can and some cardboard I tested it out on. Only complaint is the harness/sheath as it is useless as a harness. I own several Honshu style karambits, and united cutlery is the only one I have had to get a custom sheath made for it. 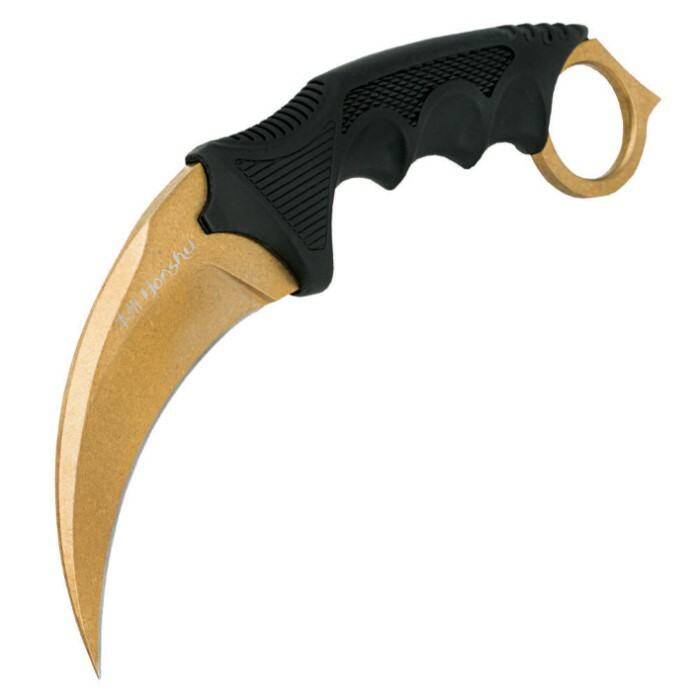 The boot sheath is great if your going to use it as a giant curved boot knife, but that would be ridiculous, so why is there a boot sheath? There is absolutely no way to secure their sheath to your belt without it slipping off when you pull it. I even contacted United cutlery and asked if they could do something about this, and they went ahead and ignored the problem. Armadillo sheaths in Columbus Texas has got youth covered. Please don't take down this post budk. People need to know this. Great knife, crappy sheath.